Get ready for National Foster Care Month in May with the official pin & ribbon set! Each pin and ribbon set is just $5 (including shipping), all proceeds benefit young people in foster care. We encourage you to place your orders early to ensure you have the pins you need for May! Bulk pricing is available in quantities of 10, 50, 100, or more - and the cost per pin is as low as $1.50/each. This is a great option for your public awareness event or fundraiser! Organizations can sell pins for the suggested retail donation of $5, all proceeds you collect are yours to keep for your programs that benefit children and youth in foster care. 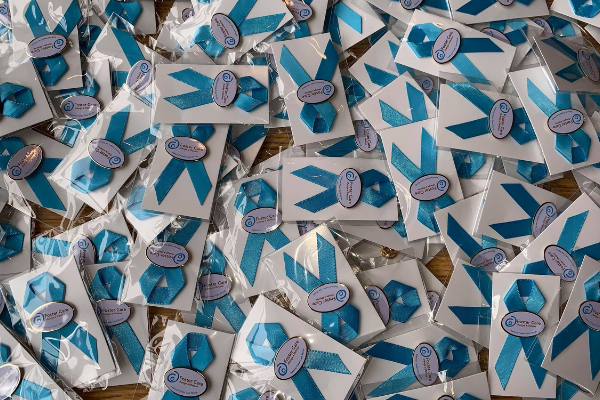 Each pin is pre-assembled with a blue ribbon, attached to white card stock, and packaged individually in a cellophane wrapper. Pins and ribbons are unbranded - add your organization's info to resell as a fundraiser. Download the flyer below for more information about the National Foster Care Month pins and ribbons, along with pricing matrix.